I have to admit that when I day goes by when I am not active on Twitter, I feel I've missed a lot. Yesterday was one of those days when I was out of the technology loop. Does that mean I am addicted to Twitter? Not really Twitter, the tool. But, definitely addicted to learning which is why I value my PLN (personal learning network) so much. It is a daily dose of learning which I believe adds up to quite a lot over time. 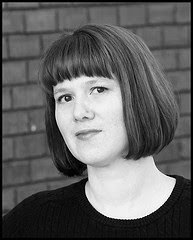 On Twitter, one of the librarians I follow is librarianbyday; she is librarian Bobbi Newman from Columbus GA, actively involved in the Transliteracy blog. From her website, I learned that "Bobbi is dedicated to helping libraries find their place in the digital age. She has presented at local, national, and international library conferences on a variety of topics related to improving existing digital services through expanding traditional methods, while creating innovative new practices." Today on Twitter I learned from Bobbi about the post on Stephen's Lighthouse (Stephen Abrams) blog: Top Ten (10) Social Media Competencies for Librarians. This is a must-read post for all librarians who want to keep current in the profession. I really think that where we need to go with all this is in leading our students to find their place in the digital age. We need to be modeling what a PLN looks like, including students in our PLNs and encouraging students to develop their own networks for learning. After all, when I first learned on a PC in the early1990s my initial teachers were students because most adults at that time had no clue about how to use a computer, do email, save documents, etc. Bobbi Newman's tweet at 7:03 am this morning has been retweeted about 15 times in just one hour. Think about how quickly hundreds, even thousands of people have read/seen Stephen's Lighthouse post about social media competencies for librarians. That is truly learning at the speed of light and also generating an incremental shift in the way we all think about the work we do. According to a New York Times article, "the new Kindles, which will ship Aug. 27, have the same six-inch reading area as earlier Kindles but weigh about 15 percent less and are 21 percent smaller. The Kindles have twice the storage, up to 3,500 books." And the expected price? $139 (yes, one hundred thirty-nine dollars). No wonder the articles also notes that "some analysts are predicting that e-readers could become this year’s hot holiday gift." Summer birthday, anyone? Wired and tired. . . In this morning's Slatest : Is adolescent exhaustion just a fact of life or is it a result of too many technological distractions? Either way it is important to realize many of our students are working on less than the ideal 9 hours of sleep. I connect this idea of transliteracy to the recent rush to judgement on the initial media coverage of USDA official Shirley Sherrod. Organizations, newscasters, media pundits and professional journalists need training in research to verify stories. Consider the flap caused by a Tea Party activist when he deliberately edited film to defame Sherrod. The fact is Ms. Sherrod did help the white farmers mentioned in her speech. They personally credit her with helping to save their family farm. Next time we are confronted by a racial controversy broken by Fox News or their allies in the Tea Party like Mr. Breitbart, we will consider the source and be more deliberate in responding. The tape of Ms. Sherrod’s speech at an NAACP banquet was deliberately edited to create a false impression of racial bias, and to create a controversy where none existed. This just shows the lengths to which extremist elements will go to discredit legitimate opposition. This makes me wonder how increasingly flawed the nightly news is on any channel. This certainly isn't the era of Walter Cronkite. Therefore, it is our duty and mission as librarians to teach critical thinking, the value of verifying sources, and the need to look at a variety of perspectives and viewpoints. As you can see, FOX news isn't the only culprit in this story. The NAACP went along with this story on racial bias before making any serious inquiry into it. Is it really necessary to come out with a statement in the middle of the night? Yes, information is coming at us like a firehose, but our responses to it require deliberation. We are at the start of the "Big Shift" away from the 20th century defined by hyper-consumption towards the 21st century, an age of Collaborative Consumption. But just how LARGE and FAR-REACHING is this groundswell? Watch & listen. It seems to me that this ties in with the notion of "cognitive surplus" as explained by Clay Shirky. He argues that the time Americans once spent watching TV has been redirected toward activities that are less about consuming and more about engaging—from Flickr and Facebook to powerful forms of online political action. And these efforts aren’t fueled by external rewards but by intrinsic motivation—the joy of doing something for its own sake. I think that the enthusiasm for saving resources and sustainable living are a part of this shift. "We [librarian and professor] munched, brainstormed, and hammered out a work-in-progress whose basic premise was: do less, but do it more often until less became more." "This time the accompanying assignment was titled "Why My Database Rocks, and Why it Wobbles;" in other words, assess its strengths and weaknesses. The follow-up was to e-mail Dave [the librarian] with the name of the database they consulted, tell him why it was "wobbly," and ask him to suggest others. (These exchanges were copied to me [the professor].)" "I can’t emphasize this enough: contact your library specialists." And from the comments: "librarians (myself included) need to do a better job explaining the various possibilities of library instruction." This article could easily be part of Library Departments' package/handouts at new teacher orientations. At a minimum, it's worth some discussion about different perceptions and changing roles. Learn more about Google Images' new look in an article and slide show from PC Magazine OR check out the new look for yourself. Makes me think a bit of CoolIris and I predict students will like more images in the same space. I'm generally positive about the Google Images change, though I can't say the same for Google News. I really miss the categories and mix of content that used to be there -- now Google News just seems to be a list of the most "popular" stories (and truly, how many stories about Lindsey Lohan does one need to see?). Yes, I know that I could build a custom filter, but I prefer to scan the news with the hope that I might serendipitously come across a story or two of interest (not unlike the "olden" days of turning paper newspaper pages...). What do others think? Have you set a custom filter? What site do you suggest instead of Google News to get a quick overview? Electronic books have only been available in the Amazon.com store for less than three years, but the online retailer sold 143 for every 100 hardcover books over the past three months. Now that the search giant has stopped automatically rerouting traffic to a censorship-free site in Hong Kong, Chinese officials will allow it to continue operations in their country. Also, interesting is author William Powers, point of view in Hamlet's Blackberry : To Surf or Not to Surf? Powers aim in Hamlet's Blackberry " is to help teach people how to connect more wisely. To that end, Powers looked to the past, where he found several precedents to both the current information age and the anxiety that has come with it. " 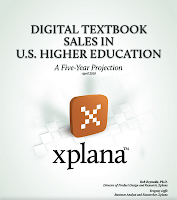 Actually, it's Blackboard AND Follett, AND Barnes and Noble AND McGraw-Hill. Oh my, indeed! Those organizations announced this week (see press releases on 7/14) that they are working to integrate digital content and streamline access of digital textbooks directly through Blackboard's learning management system. While this initiative is certainly focused on colleges and universities, the combined use in high schools cannot be far away. Supposedly, educators will more easily be able to evaluate and assign digital texts and students could be able to take notes and highlight electronically using Follett's CafeScribe or Barnes and Noble's forthcoming NOOKstudy. Important developments to watch, especially given our current relationships. Here's a more complete description from Inside Higher Ed. Librarians at the University of South Florida are creating the Gulf Oil Spill Information Center. YOU can help -- suggest a resource on their form, share the K-12 lesson plans, or modify their guide to fit the needs of Social Studies or Science educators and the students you know. According to Springshare/Libguides, "permission to copy 'Best Of' guides [like this one] into your system is granted by their librarian-creators ahead of time." What a important opportunity for collaboration. Please take a minute and just listen ... a little bit of inspiration for that first Institute Day in August? Another version available here. As noted last week by Richard Byrne, this is one of "Seven Videos all Teachers Should Watch"; we have previously blogged about several of his other recommendations. Social media is here to stay- Check this out! Just a fad? Be sure to click on +1 day; +1 week; +1month; +1 year. Answer Garden --Use it as a tool for online brainstorming or embed it on your website or blog as a poll or guestbook. Give it a try by posting your ideas below. Limitations: only 20 characters; you can only respond once per day. Why should schools unblock YouTube?... at AnswerGarden.ch. Barnes and Noble announced today the release of NOOKstudy - an application that is Free and works on both PCs and Macs. For full details, see the press release which says in part, "NOOKstudy lets students view multiple books and sources at once and offers access to complementary content (e.g. toolsets, reference materials, etc. ), as well as the unprecedented ability to highlight and take notes that are searchable and customizable." A reviewer in ZDNet concluded, "if NOOKstudy succeeds in college, hopefully we will eventually see it roll out in high schools too." What do you think? Are you interested in giving it a try? I would really like the opportunity to play with it and see how it works with textbooks and other reading materials. This video was shared by Will Richardson who says every parent should watch/listen to the interview of Seth Godin (author of Tribes and Linchpin) who argues that parents need to be more supportive of teachers who are "outliers" trying to harness the curiosity and creativity of students. 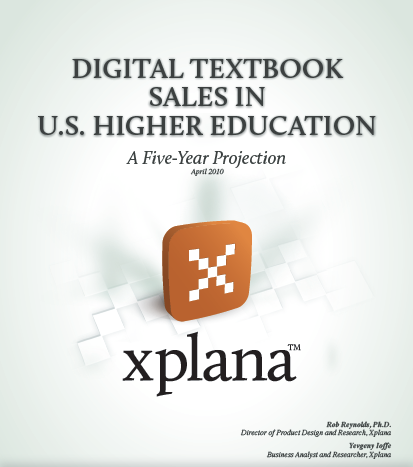 I have been doing a lot of thinking about this topic and came across a study on digital textbooks in the higher education market. The main author, Rob Reynolds, was interviewed about How Our Notions of Textbooks May Change (5:58) and Student Buying Behaviors (7:14). For more details from the main study, go here. I had several discussions with teachers this week about the role of ClassLinks pages, 21st century learning, and critical thinking. 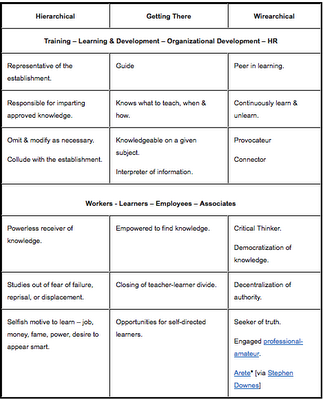 This chart about shifting roles in education and establishing a "wirearchy" is very thought-provoking. You can learn more (and see the chart more clearly) at Harold Jarche's original blog post. 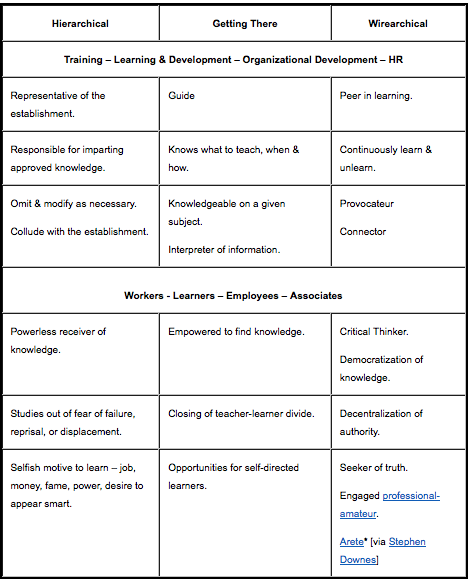 Please look at this (click on it for a sharper image) and think about our role as educators and learners and about our students filling those two roles, also. Please listen to the ISTE 2010 Learning Tools Smackdown on the ISTE Vision Network. (The beginning 15 min. is devoted to an awards ceremony for Technology Innovation). The following 1-1/2 hour segment is well worth it). Howard Rheingold is a visiting lecturer in Stanford University's Department of Communication where he teaches two courses, "Digital Journalism" and "Virtual Communities and Social Media". He is a lecturer in U.C. Berkeley's School of Information where he teaches "Virtual Communities and Social Media" and where he previously taught "Participatory Media/Collective Action". In this one hour lecture from May 6, 2010 Rheingold speaks about his early ideas of peer-to-peer learning and how he envisioned it in the mid-1990s. Now all those multi-media participatory experiences are available freely on the web. The collective voice of the classroom (group discussions/forums) is now what's important. Teaching each other is what students find to be exciting in today's classroom. Building knowledge together is now built upon chat & twitter which have become powerful backchannels to face-to-face classroom interactions. attention, participation, cooperation/collaboration, critical consumption (CRAP detection) and network awareness. 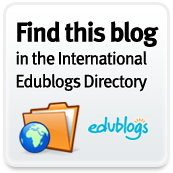 Do "student-friendly" search engines make a librarian's job easier? From Sweet Search : This "is a search engine that searches only the sites that have been reviewed and approved by a team of librarians, teachers, and research experts. In all there are 35,000 websites that have been reviewed and approved by Sweet Search. " Sweet Search can be used by visiting the site directly or you can embed Sweet Search widgets into your blog or website. I took a look at the librarian selected sites which were excellent. I like the idea of embedding their widgets easily into our Libguides. This sounds great! But wait a minute,I can't help but feel that there is essentially a big "shortcut" here that could leave long negative long-terms consequences for teaching search strategies. If we exclusively use these type of tools when are we able to introduce concepts of critical thinking and web site evaluation? Professor Howard Rheingold has developed a wiki called Critical Thinking Compendium where there are already dozens of resources linked. Here is Howard Rheingold's Diigo feed for the tag "critical thinking"
Here is Howard Rheingold's Diigo feed for the tag "crap detection"
Don't get me wrong, I think I will definitely be using some Sweet Search widgets in the future. But we cannot afford to outsource our role as teachers of digital literacy. Paper.li - read a Twitter stream as a daily newspaper . You have to sign in using a Twitter account and then authorize Paper.li with your Twitter account. This newspaper is generated daily at a dedicated permalink which you can check at any time to see what everyone's discussing in your personal follower universe or currently in the news. Try this one out with someone you follow or type in a hashtag # such as #worldcup and see instantly entire "newspaper" on that topic. Quite thrilling. One new feature is the ability for all users to create newspapers based on Twitter lists. A list newspaper is a great way to stay tuned to what a well defined group of people are sharing, without necessarily following them yourself.